The following instructions are for those modelling e-stack ventilation systems using IES-VE or EDSL’s TAS software, they are suitable for use primarily for overheating modelling, but also Part L compliance modelling. 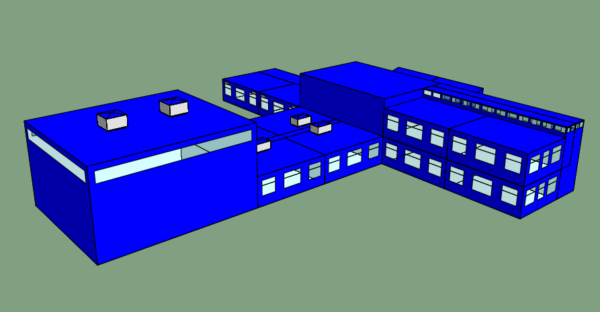 Users of other dynamic thermal modelling tools can contact breathing Buildings directly for modelling instructions. The geometry of our roof mounted stacks is available as a .gem file to download. Different geometry is provided for the e-stack R-Series, S1200 and S1500 units. Instructions on how to model the different ventilation profiles are also available to download and the profiles themselves are embedded in the .cab file for download. We have provided a set of PDF user guides on modelling e-stack natural ventilation systems in EDSL TAS software. These can be downloaded from the Downloads box on the right hand side of this page. For advice not covered within these guides, please contact the Breathing Buildings office, or speak to EDSL directly. If you have any queries whilst modelling your building with e-stacks please contact Breathing Buildings directly and we will be happy to help! The main advantage of the e-stack system over other natural ventilation systems is that in the winter, we do not bring in air via opening windows, as this requires a large amount of preheating energy. Instead we operate in ‘mixing mode’ where we bring in air at high level and mix it with warm room air to create a tempered air stream which is comfortable for occupants. To accurately model conventional natural ventilation systems, preheating at the low level openings would have to be incorporated. However as thermal modelling software and building regulations do not take account of thermal comfort in relation to draughts; any energy input to mitigate cold draughts does not need to be included. So the e-stack system will look the same as any other natural ventilation system in terms of heating energy consumption, because the need for preheating is disregarded by traditional modelling techniques, which only take into account the bulk air temperature. Please see our Comparing Energy Saving in IES page in order to see the actual energy savings that the e-stack system has over the alternative of preheating incoming air or using MVHR instead of a natural solution.